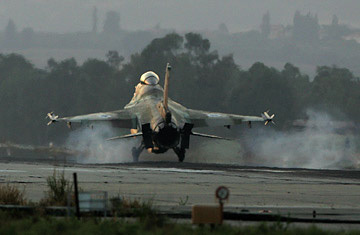 An Israeli F16C Jet fighter returns to Ramat David air force base in northern Israel. Despite President Bush's insistence that the military option remains "on the table" for dealing with Iran's nuclear program, Israeli officials have recognized that a U.S. air strike on Iranian nuclear sites is increasingly unlikely in the waning days of the Bush Administration. The Israelis, along with everyone else, are now counting on European-led diplomatic efforts to persuade the Iranians to halt their uranium-enrichment program. But they know diplomacy may fail, which is why a debate now rages in the highest circles of Israel's government and military: If the Europeans fail and the Americans remain reluctant to launch another war in the Middle East, should Israel strike alone against Iran? When President Bush visited Israel in mid-May, senior Israeli leaders came away from talks confident that the U.S. would attack Iran if it refused to stop enriching uranium. Says one top Israeli military planner privy to Israel's discussions with the U.S. on Iran: "We were under the illusion during Bush's last visit that he was much more determined to order a military action." No longer. Last week's U-turn, in which the Bush Administration sent a high-ranking State Department official to join the European delegation meeting Iran's top nuclear negotiator, and the proposal was made to open a U.S. Interests Section to handle consular matters in Tehran  which would be the first U.S. diplomatic presence in Iran since its embassy was stormed in 1979  has stunned Israeli officials. So dismayed were the Israelis by the latest U.S. moves, one military source told TIME, that Prime Minister Ehud Olmert wrote to Bush complaining that Israel should have been forewarned about the White House's abrupt change of course toward Iran. Just last month, Israel conducted a complex military exercise, involving more than 150 aircraft flying 900 miles over the Mediterranean Sea, that was widely interpreted as a rehearsal for an air strike against Iran's dozens of nuclear facilities. A top former officer from Mossad (the Israeli equivalent of the CIA) told TIME that Israel is mindful that an air strike on Iran would jolt the U.S. presidential election  probably rebounding badly on Republican contender Senator John McCain. Sources say that Israel sees a narrow "window of opportunity" for military action opening up between November and the swearing-in of the new American President next January. "No Israel leader wants to be blamed for destroying the Republican chances," says the former Mossad officer. But will Israel really go it alone and attack Iran if talks break down, or is the threat simply a bluff aimed at prompting the U.S. and Europe to step up the pressure on Tehran? Until now, Israel has been using a "hold me back, or I'll do something crazy" tactic, concedes the exMossad officer. The Israelis do believe time is short. An Israeli military planner estimates that Iran will reach "the point of no return" in developing the capacity to build nuclear weapons by early 2009. The U.S. sees things differently, he says, calculating that Iran will have enriched enough uranium to weapons-grade to be able to build a bomb by mid-2010. Both scenarios, says the Israeli planner, "give them some leeway for negotiations, but not much." Despite Israel's top-notch air force, launching a long-range strike against a multitude of hidden targets in Iran entails huge risks and uncertain rewards. At most, say Israeli intelligence sources, an attack  which Israel would undertake with only a nod and perhaps logistical support from the U.S.  is likely to stall Iran's program by just a year or two. And that makes the cost-benefit analysis weigh against an air strike on Iran, according to some senior Israeli officials who urge caution. Active and retired Israeli intelligence officials interviewed by TIME tended to dismiss Iran's threats of retaliation against Israel and the U.S. Ephraim Halevy, the previous Mossad chief who now heads the Center for Strategic and Policy Studies at Hebrew University in Jerusalem, says, "Iran is not 10 feet tall." Halevy contends that a barrage of Iran's missiles on Israel would not do too much damage, since dozens would be shot down by Israel's advanced antimissile system. (Iran staged a missile test recently in which the published photo was doctored to hide the fact that one of the fired missiles was a dud.) Halevy claims that the "relative success" of the U.S. military's surge in Iraq has curtailed Iran's capacity for mischief among its Shi'ite brethren in Iraq. He also doubts that Iran's ally Syria, which has long-range missiles, or its Hizballah and Hamas allies would risk a major dustup merely to exact revenge on Iran's behalf. Still, Halevy warns that the long-term effects of attacking Iran could be devastating for Israel  and the region. "This could have an impact on us for the next 100 years," he says. "It will have a negative effect on public opinion in the Arab world, and we should only do [a strike on Iran] as a last resort." Meir Javedanfar, a respected, Iranian-born writer and analyst specializing in Israeli-Iranian relations, warns that an Israeli attack would unite Iranians around their hawkish President, Mahmoud Ahmadinejad. "This would guarantee that Ahmadinejad wins next year's elections," says Javendafar, who adds that right now the incumbent's re-election is in doubt because of the economic hardship he has brought to Iran's middle classes. Whatever the real prospects for military action, in the game of rhetorical brinksmanship, Israel has matched every hotheaded statement from Ahmadinejad with threats of its own. The Israeli press often compares Iran's bellicose, Holocaust-denying leader to Hitler. In the past few months, right-wing Israeli politicians, retired generals and pundits have ratcheted up rhetoric, calling on Olmert to quash the "existential threat" from Iran. But lately, these war cries have been toned down, in part to prepare the Israeli public for the possibility that Israel will not attack Iran on its own. Says one former senior Mossad officer who served under Olmert: "Iran's achievement is creating an image of itself as a scary superpower when it's really a paper tiger." In Tehran, meanwhile, more sober heads among the clerical leadership whose authority is greater than the President's are reining in Ahmadinejad, says Javedanfar. After a public scolding in a conservative newspaper by a top aide to Iran's Supreme Leader, Ayatollah Ali Khamenei, Ahmadinejad several weeks ago publicly declared that Iran has no intention of attacking Israel or anyone else unless it is hit first. Halevy concurs. "I don't detect an appetite among the Iranians to bring about a catastrophe," he says. But, he cautions, "There's a narrowing gap of opportunity for negotiations." The danger remains in this high-stakes game of brinksmanship that either Israel or Iran could push the other too far. But the Bush Administration's sudden overture toward Iran, and its moves toward engaging it diplomatically in search of a solution to the nuclear impasse, make it more likely that Israel will follow Washington's lead rather than striking out on its own.